Forest fire in Palangkaraya, Central Kalimantan, Indonesia. Photo by CIFOR/Flickr. The land and forest fires burning across Indonesia spiked to historic highs this month, causing a thick haze of toxic smoke that enveloped cities across Indonesia and neighboring countries. Officials across the region have pledged to investigate the perpetrators of these fires and hold those responsible accountable. A new campaign from Tomnod and WRI’s Global Forest Watch platform allows people everywhere to aid in the investigation. Digital Globe has been collecting satellite imagery of the burning across Indonesia for major fire outbreaks this year, capturing massive land areas with potentially thousands of fires and burn scars that could be used as evidence in enforcement actions by police. The company is now making these images available on Tomnod, its crowdsourcing platform most familiar because of the search-and-rescue mission for the missing Malaysian Airlines flight MH370. The platform has enabled millions of people to contribute to humanitarian and environmental campaigns and to support disaster-relief operations. The problem is that there are huge areas of imagery to examine on Tomnod platform. Tomnod staff say that just the current images (only a small fraction of what will be posted over the coming week) would take a single person up to 10 weeks to analyze. People everywhere can search the latest satellite imagery and “tag” every fire and visible burn scar. This will allow law enforcement officials to prioritize reviewing these tagged images, and more quickly identify and respond to illegal forest clearing. The data collected from Tomnod, along with ultra-high resolution imagery collected by Digital Globe, will provide valuable evidence to document the location and extent of illegal land fires. Enforcement actions have already begun—the Indonesian National Police have reported charging 127 individuals and 10 corporations with violations associated with the fires. And officials in Singapore are investigating violations of the Transboundary Haze Pollution Act to hold companies accountable for fires that cause high levels of pollution within Singapore. Crowdsourced fires and burn scars are shared on the Global Forest Watch Fires map (view crowdsourced data from 2014 here). Data from the current campaign will be available online once enough information is available. 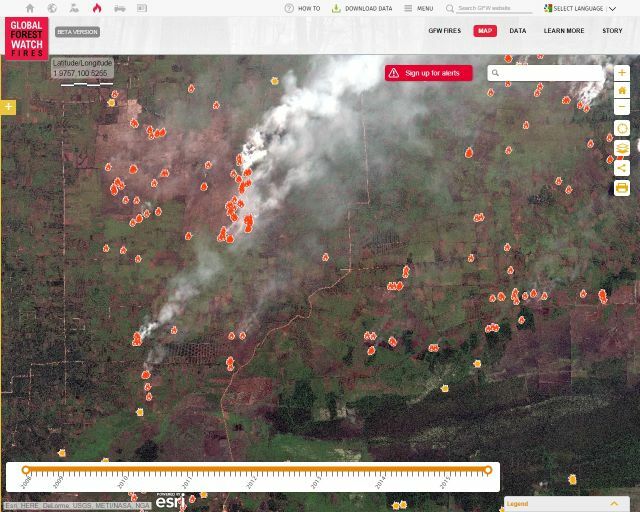 Crowdsourced fire and burn scar locations are shared on GFW Fires and can be viewed with ultra-high resolution imagery from Digital Globe collected during major fire outbreaks. The campaign to identify land fires in Indonesia is yet another way of disseminating the message that illegal activity will no longer be tolerated. Our vision is that in future years, smoke, haze and the ill health that they bring will no longer be an annual occurrence in Indonesia. 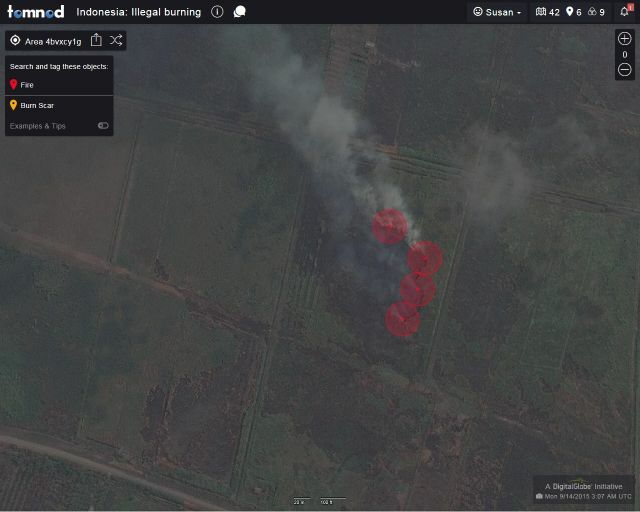 To get involved, visit the Tomnod website and choose the “Indonesia: Illegal Burning” campaign. The introductory text explains your mission and shows some examples of how to search for fires and burn scars.